This post is part of a series on Saving for College— read more about getting started with a 529 account and the 4 big things you should contemplate now if you have kids who may be college-bound in the future. Even if your kid is still in diapers, it’s never too early to start thinking about whether — and how — you’ll pay for their college education. When it comes to saving, 529 plans are the most popular investment vehicle. In more than 30 states, you can deduct contributions from your state taxes, and no matter where you live, earnings are tax-free. Withdrawals will be, too, as long as your child uses the money for qualified higher education expenses at any eligible institution. 529 plans are also popular because they don’t have contribution limits. The only “limit” is that, if you contribute more than $15,000 in a year, you’ll have to report it as a gift on your taxes. It will then count toward your lifetime gift tax exclusion limit (which you don’t have to worry about unless you plan to give away more than $5.6 million in your lifetime). There is, however, an exception to the $15,000 rule — and it could serve as a powerful tool in preparing for your child’s college expenses. Unlike retirement savings, which have decades to compound and grow, you’ve usually only got around 18 years before you’ll need to pay for Junior’s education. To help compensate for this, the IRS offers a workaround: You can fund a 529 with up to five years of contributions at once — up to $75,000 per parent, for a total of $150,000 — without it counting toward your lifetime gift tax exclusion limit. This feature, called superfunding, dramatically increases how much money you can use to jumpstart a 529. 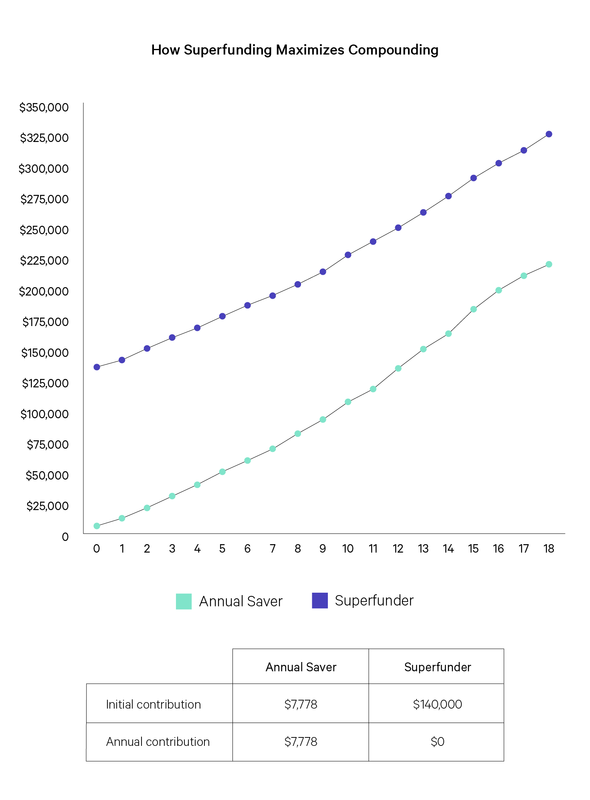 Why is superfunding a 529 plan so effective? When you front load your contributions, the account gets a full 18 years to compound. Annual saver: Every year for 18 years, William and Kate diligently contribute $7,778 to a 529 plan, for a total of $140,000. Superfunder: On the day their child is born, Harry and Meghan superfund a 529 with $140,000, and then go on their fabulous way, never touching the account again. 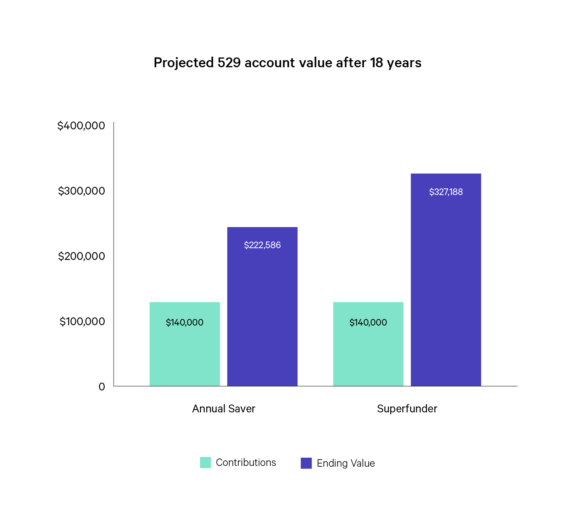 Both accounts earn the annual expected returns associated with the Wealthfront 529 College Savings Plan; for a client with a high risk score, that’s an average of 4.7%. Can you believe the results? Although both couples contributed the same amount, Harry and Meghan’s child will end up with 47% more money in their 529 account — all thanks to superfunding. Research shows you can increase your future wealth by taking advantage of “commitment devices” that lock you into a good course of action today — and prevent you from making poor choices tomorrow. Liquidity: Can you really afford to take $140,000 and lock it away in a tax-deferred account for 18 years? You’ll face stiff penalties if you withdraw money for non-college expenses. Commitment: How confident are you that the money will be used for your child’s education? What happens if they win a full-ride scholarship or decide to take a different path? Though 529 plans allow you to switch beneficiaries to relatives like siblings or cousins, it’s a question worth considering. Plan selection: Some 529 plans have few fund choices and high fees. So, if you’re going to superfund, make sure it’s into a low-cost plan with high-quality investments. Windfalls are large, one-time financial gains; they could occur when your employer goes public, for example, or when an elderly relative leaves you an inheritance. If you’ve received a windfall, superfunding a 529 plan might be a good way to use it. Not only will it create a healthy college fund for your child, it could bring you peace of mind as well. Here’s what we mean: How would it feel to know you’ve made a significant contribution to your child’s future education — without the need for ongoing savings and maintenance? Probably pretty good. That’s why, if you have the resources, superfunding a 529 is a smart strategy for reaching your college savings goals.